Nick Kyrgios has admitted he needs to decide whether he’s “willing to do the best” for his tennis career, following an impressive victory in his opening match at the Miami Open. 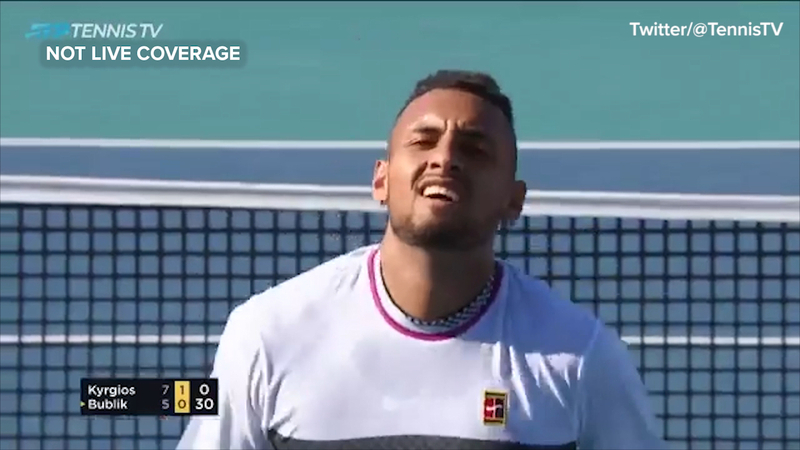 Kyrgios easily accounted for Kazakhstan’s Alexander Bublik in just 69 minutes, 7-5, 6-3, to setup a third round meeting with Dusan Lajovic, with a potential quarter final against 11th seed Borna Coric down the track. After the match Kyrgios was asked about the knee injury that has troubled him over recent months, when he made the frank admission. “It’s feeling good now, I think I had to lay off the basketball a little bit, I was playing a lot of basketball in the preseason,” Kyrgios said in an interview with the Tennis Channel. “That’s a question about my career right now, whether I’m willing to do the best for it. Kyrgios impressed during a stint in the commentary booth for Wide World of Sports during January’s Australian Open, and he admitted to the Tennis Channel that it’s a path he may pursue down the track. “I can see myself maybe one day joining you guys, I think my knowledge about the game is very high,” he said. “I coach myself so I feel like tactically I know what peoples weaknesses are, and how they are off the court. “I feel like it’s a different insight, I spend time with people in the locker room as well. The world number 33 has been through a tough period, with his ranking dropping to 72 in February, his lowest ranking since 2014. However a breakthrough win three weeks ago in Acapulco, where he beat both Rafael Nadal and Alex Zverev on the way to the title, have raised hopes of a return to the upper echelon of the sport. “Yeah for sure, I’ve dealt with a lot of things in the last couple of years, off the court, that have put me in a lot of dark places,” he said. “I think I’m responding well, I’m just trying to find myself every day, I definitely know I’ve got a lot of things to work on, I’ve got to work harder, I’ve got to work on my game. “Maybe that involves getting a coach, maybe stop playing basketball at ridiculous hours, but I’m just having fun with it. While Kyrgios advanced, the news wasn’t so good for John Millman, who went down in three sets to Argentine Federico Delbonis.